Mi-8AMTSh-VA Arctic helicopter is operational with the Ministry of Defence of Russian Federation. Image courtesy of Russian Нelicopters, JSC. Mi-8AMTSh-VA incorporates VK-2500-03 engines. Image courtesy of Russian Нelicopters, JSC. Mi-8AMTSh-VA has a range of 1,300km. Image courtesy of Russian Нelicopters, JSC. Mi-8AMTSh-VA Arctic helicopter is manned by three crew members. Image courtesy of UUAP JSC. Mi-8AMTSh-VA twin-engine helicopter is specially designed to perform the Russian Armed Forces’ missions in Arctic environmental conditions. It is based on Mi-8AMTSh-V military transport helicopter, a modernised variant of Mi-8AMTSh helicopter. Built by Russian JSC Ulan-Ude Aviation Plant, the Mi-8AMTSh-VA was inducted into the Arctic units of the Ministry of Defence of the Russian Federation in November 2015. The aircraft is capable of operating in low temperatures and light conditions and can execute a number of missions such as ambulance, transportation and landing operations, aerial reconnaissance and targeting, and search and rescue. The helicopter can also be used by oil and gas companies in offshore exploration activities. 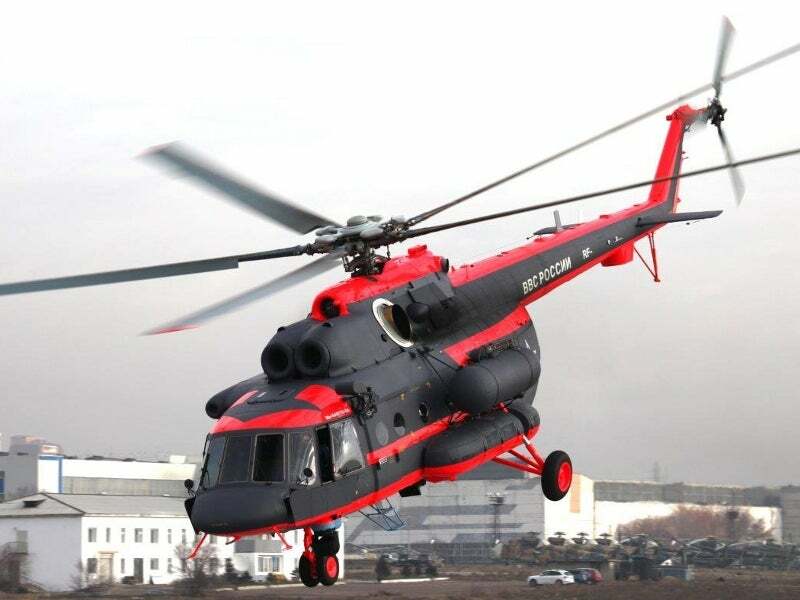 The Ministry of Defence of the Russian Federation signed a contract with Ulan-Ude Aviation Plant for the manufacture of Mi-8AMTSh-VA helicopters in February 2015. The Russian Arctic forces took delivery of a Mi-8AMTSh-VA helicopter in November 2015. Another four Mi-8AMTSh-VA helicopters are planned to be delivered to the Russian Armed Forces by 2020. Russian JSC UIMDB, a member of JSC KRET, developed and supplied navigation and communications systems for the MI-8AMTSh-VA Arctic helicopter. The helicopter took part in Army 2016 international military technical forum held in Russia in September. Mi-8AMTSh-VA, which is built using composite materials, features five-blade main rotors and a three-blade tail rotor. Its tri-cycle landing gear enables safe landing on difficult terrains. The Arctic helicopter has a three-seat cockpit fitted with a digital autopilot, an electronic display system, digital avionics and duplicate satellite systems. The 5.34m-long cargo cabin with an effective area of 12.5m² can house payloads of 4,000kg, whereas the external payload capability is 4,000kg. With a maximum take-off-weight of 13,000kg, the helicopter can accommodate up to 36 persons, whilst transporting up to 12 wounded on stretchers in ambulance configuration. Standard equipment of the MI-8AMTSh-VA include cockpit and cargo cabin heating systems, improved insulation materials and insulating shades, lighting fixtures, an air data measuring system and light annunciators. The Mi-8AMTSh-VA helicopter’s advanced avionics and strapdown inertial navigation system enable highly autonomous and efficient operational performance in polar regions. Airspace observation systems are used to detect incoming threats, while the communications suite provides reliable, un-interrupted radio communication across a range of frequencies. The night vision equipment provides operators with the ability to operate during low light or night conditions. For search and rescue missions, the Arctic helicopter uses a radio direction-finding device, which can operate on all emergency frequencies. It also comes fitted with a weather radar that helps to identify and recognise objects on the ground and sea, both horizontally and vertically, in dangerous weather conditions. Special covers are fitted to ensure high efficiency of the systems that are used to heat the main components of the helicopter in low temperatures. The helicopter’s composite armour plating offers high protection for cockpit and cabin. The on-board protection systems provide automatic threat detection and defence against electromagnetic interference. Powered by two Klimov VK-2500-03 turboshaft engines and enhanced gears, the Mi-8AMTSh-VA Arctic helicopter can operate in challenging weather conditions of Arctic and Far North. It can withstand temperatures lower than -40°С. The helicopter carries four additional fuel tanks, which enable flying over a range of 1,300km. It also features a TA-14 auxiliary power unit with improved thrust to provide enough power to the onboard heating systems. The helicopter’s operating capability is further improved with oil and fuel systems and Teflon hydraulic flight control hose. The maximum speed of the helicopter is approximately 250km/h.